The boundary-value problem of axisymmetric deformation of an elastic circular sandwich plate asymmetric across its thickness under the action of local loads is formulated. The effect of a temerature field on the stressstrain state (SSS) of the plate is considered. 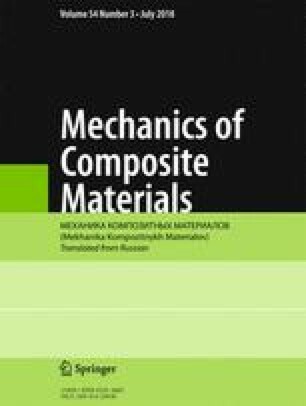 To describe its kinematics, the hypotheses of broken normal are adopted, assuming Bernoulli hypotheses in the thin extern layers and the Tymoshenko hypothesis in the filler incompressible across its thickness. The work of filler in the tangential direction is taken into account. The equilibrium equations are derived using the variational method. An analytical solution of the boundary-value problem is obtained in the general case of loading of the plate by an axisymmetric surface load. The cases of local circular, annular, and linear loads are considered. A numerical analysis of SSS is performed for a plate hinged along its contour. Translated from Mekhanika Kompozitnykh Materialov, Vol. 54, No. 3, pp. 445-462, May-June, 2018. This work was performed at the Moscow Aviation Institute at the support of the Russian Scientific Fund (project No. 14-49-00091-P).